When the cold weather sets in for the winter, you know that nothing is more important than the peace of mind that your furnace will work when you need it. That's why all of our 5-Star Technicians have the tools and knowledge to solve any furnace problem you may be having. 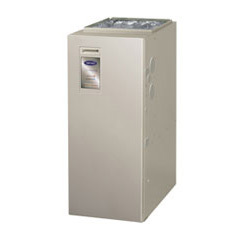 If your furnace is over 20 years old, chances are it needs to be replaced... which is a good thing when you really think about it! Today's furnaces burn much more efficiently than their predecessors, and since your home's heat can account for 35-50% of your annual energy expenses, installing a new furnace can mean big savings. With AFUE precise temperature control options, most energy efficient furnaces comply with government tax credit rebates claims. So do yourself and your wallet a favor, and see if having a new furnace installed is right for you. Looking for the NYC Area heat pump experts? Then look no further than Metro Air Conditioning! Our technicians are highly trained in servicing heat pumps throughout the New York City Area. Heat pumps work differently than you may think. Rather than generating temperatures, heat pumps move hot or cold air (depending on the season) from outside to inside your house based on your comfort needs. What does all this mean to you? Big savings! Because heat pumps move air rather than generating it, they offer savings unparalleled by any other heating or cooling system options. If you're looking for a high efficiency heat pump, than you're in for even more savings! High efficiency heat pumps dehumidify better than a standard central air conditioning unit, thus, trimming your saving even more during the warmer months. If you are having any of the following problems with your heat pump, then make sure to contact the heat pump experts at Metro Air Cool today. During our long, hot, and steamy New York City summers, nothing is more valuable than air conditioning! Coming home to a cooled is so important and Metro Air Conditioning wants to be your service company of choice when it comes to helping you with your air conditioning. 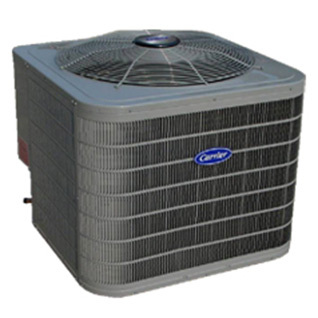 We also offer a fantastic line of energy and money saving air conditioners if the time has come for you to purchase a new system. Schedule a sales appointment or service appointment now and get the peace of mind of using an industry leader like Metro Air Conditioning for all of your air conditioning needs. Your home comfort system's thermostat really is the doorway to your comfort. 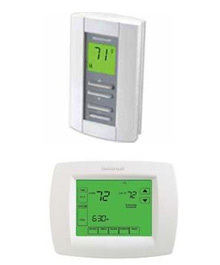 Thermostats have really come a long way in the last few years with new features including touch-screen interfaces, remote access, and more. Did you know that setting your thermostat to automatically decrease the temperature 10�-15 � for 8 hours a day can save you 10% on energy costs throughout the year. Metro Air Conditioning carries a line of thermostats that offer the precise control you desire for your home's atmosphere, anytime during the day or evening. Clean Condenser Coils Dirty condenser coils will raise refrigerant pressure higher than needed, increasing your electric bill. Cleaning the coils will keep your equipment at maximum efficiency while at the same time, saving you money. Check the Refrigerant Charge The refrigerant charge is checked by measuring temperature differential and determining electrical demand on the compressor or by reading the pressure gauges. A low or high refrigerant charge can easily go unnoticed and increase operating costs. An improper charge can also cause compressor shut-down. Periodic checks on refrigerant levels can lower your energy bills and prevent future repairs. Inspect and Clean Out Condensate Drain Clogged drains can increase the humidity level and cause extensive water damage. Proper maintenance of the condensate drain can prevent unwanted repair calls. Inspect Blower Wheels Dirty blower wheels reduce air flow, causing longer operating time and increased energy cost. This problem can lead to lost comfort and compressor failure. Avoid wasting your energy dollars by verifying that your maintenance includes a thorough check and cleaning of your blower system. All leading manufacturers recommend regular maintenance to maintain peak performance. Contact us to schedule an appointment online. Don't forget, a Servic Agreement plan comes with schedule maintenance checks as well. PTAC AC PTAC units (Packaged Terminal Air Conditioner), are unique air conditioning units. They act much like a standard window or wall air conditioning unit but are meant for thru the wall installations. Besides providing you cooling comfort in the hot weather days of summertime, they also provide you heat to warm your surroundings in the cold winter days. These units are not meant for every application where a window or wall unit can go, there are many reasons for that, one such being they require more work for installation and are a permanent fixture to the house. With a window air conditioning unit all you need to do is open the window and remove the air conditioner, with a PTAC you invest in opening a hole into the wall for the sleeve. PTAC units also do not come in as many varied BTU sizes as window or wall air conditioners do. 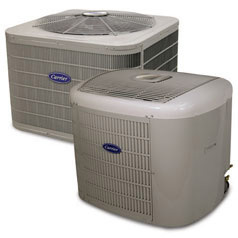 Both styles of air conditioning units work with the same basic parts and both air conditioning units require the same maintenance of the filter. PTAC units are generally larger, more expensive, and require specialized care. When the PTAC does need repair this is where we come in, we have a crew of professional servicemen who only work on PTAC units, this is their skilled specialty. crew of professional servicemen will come to your home and diagnose all functions of the unit. Doing this will ensure you the peace of mind that the unit will be repaired correctly, they will explain to you what needs to be done, what the cost will be and when you can expect a proper working PTAC returned to you. Contact us for pricing, specifications and availability. 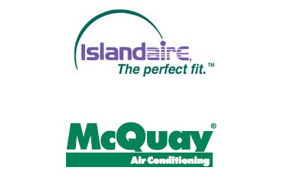 We stock replacement units for McQuay, American Standard, Slantfin, Zoneaire, Ice cap,Simon-Aire, American Air Filter AAF, Trane, Friedrich,Ice Aire, GE, Amana, Carrier Embassy/Weather Twin, Remington, Climatemaster, TPI, Cool Heat, and Islandaire cooling systems and heating systems. We have brand-new air conditioning and heating systems with digital controls or traditional push-button controls. FREE In Home Surveys for purchase of new PTAC units. Service and Repair on most makes and models. Freon level checked and replaced if needed this is to ensure maximum cooling. PTAC Heating & Cooling series is a heavy-duty direct replacement for older and current model series chassis. Proven technology, quality components, the latest in reliability and efficiency advances assures long life, user satisfaction, and lower energy costs! Water Source Heating Cooling Designed for easy installation and compadability. Replacement units identical to original units. Great for replacement or new construction proven technology, quiet durable and efficient.